This week I am writing about a wonderful breakthrough I had in researching in my children's LEWIS line, for Arthur Gifford CAMPION. A wonderful name, isn't that? I 'knew' the Gifford was likely a maiden surname, but whose, and where? 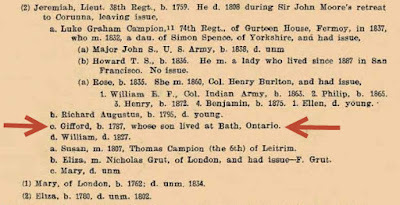 From research on his daughter's marriage to Charles LEWIS, and her death in Bath, Ontario, Canada, I knew she was born in County Cork, and that the family appeared in Ontario between 1840-1844. But I had little luck finding more details in Ireland. I received a friendly email from an Irishman named Chris, who came across my earlier blog about Arthur, and wrote me. He mentioned knowing there were many Campions in Co. Cork, and I should look there... (I'd been looking but with very little results). A few emails back and forth, and he pointed me to the Grove White Notebooks on the website: Cork Past and Present. A few more emails back and forth, and I finally typed in "Grove White" and found the notebooks: click on Places, then on North Cork, to see Grove White in the left side panel. He also told me the Campions he knew of were in North Cork [county], in the Leitrim Castle area. A-ha!! By flipping pages through the several notebooks, I found Leitrim Castle, and details of the land ownership, and more. I quickly realized that King Charles II [photo to the right] who returned to the throne after Oliver Cromwell died - had rewarded the many officers of the 1649 Army [who had been involved in crushing Ireland under Cromwell], by giving them Land Patents, from 1657 onwards. From Page 13 onwards, you can read about the previous owners of the land, the total acreage and value of the rents of the land, and more, in the pages. I found it interesting to see sources mentioned relating to this Campion family living from medieval times in Essex, relating to Nicholas de Campion, a Norman Crusader. p.18: "CAPTAIN THOMAS CAMPION, of Leitrim, of the 1649 Royal Army of Ireland, b. 1619. 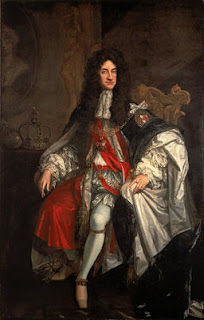 He received a patent grant of Leitrim estate, Co. Cork, from Charles II, 26 Nov 1667." There followed more details of Capt. Thomas CAMPION, his lands, a few photos of the Campion Family Vaults, Leitrim Church, and more. 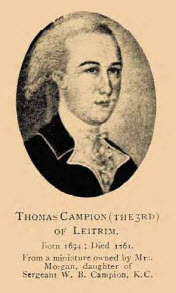 Thomas CAMPION became one of the first members of the Society of Friends in the area, along with others of the Army; he was buried in 1699 in the Quakers' Burial Grounds in County Cork. The miniature on the right is of Thomas Campion the 3rd. 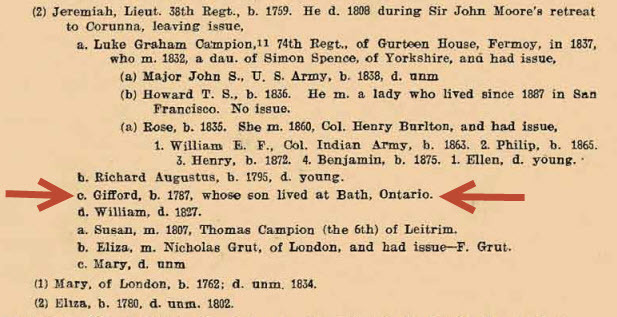 This third generation named Thomas Campion married Mary, second daughter of John GIFFORD (son to Col. John GIFFORD, a fellow grantee of 1666) - which is where I began to get very excited. There's that name Gifford. c. Gifford, b. 1787, whose son lived at Bath, Ontario. You know what I did next, right? I sat up until well after 1am, slowly and carefully transcribing the pedigree notes in these Notebooks, from my Arthur Gifford CAMPION back to his father, Gifford, his grandfather, Jeremiah, his greatgrandfather Gifford, his 2nd great-grandfather Thomas 3rd, his 3rd great-grandfather Thomas 2nd, and finally back to his 4th great-grandfather Captain Thomas CAMPION 1st. Whew! You can see there were many repeated names in this family! Now of course, I need to do much more research, filling in with the specific documents footnoted in this notebook of Col. James Grove White. Oh, to be in Ireland, going through the records held either up in Dublin or in Co. Cork, looking for burials, wills, probates, births, and other histories of related families. In the meantime, over the coming year, I will be learning even more about searching in Ireland for more CAMPION and related individuals' documents/histories and more. The Grove White notebook implies details back to the 1300s or earlier... However, I'd be happy to find out Arthur's mother's name, and perhaps a little about Arthur's siblings! Several of the Campion men went to Australia, other Campions went to the United States, a few over to England. Many appeared to be well educated, and were lawyers, physicians, or ministers. The land provided a large revenue to the Thomas Campion family, and relatives. A number of marriages were seen to be with 1st, 2nd, 3rd, or 4th cousins. There is a large Campion Family Vault with details of the deaths of numerous family members. A huge THANK YOU to the friendly reader "Paddychris" who helped me break through this challenge. Who knows when I'd have eventually learned about the Grove White Notebooks? The Cork website was a bit difficult to search at first, as every website has its own method of organizing records and databases. This year's challenge by Amy Crow is another weekly blog based on Themes, although it seems not always relevant for me to use! We're so close to finishing another year of one ancestor/week, all year long. This week, I head into the LEWIS-RICE lines for another early ancestor, Leanah SNEED/SNEAD. Once more, we have a wife about whom I know very very little. Leanah SNEED is mentioned as the wife of John VINEYARD/VINYARD, they had at least 7 children, and on down several more generations to Martha Jane VINEYARD mother of Reba RICE, in the LEWIS-RICE lines of my ex-husband. So, Leanah is my children's 4th great-grandmother. Much of my information comes from details posted on myFamily for the VINYARD group; myFamily was "retired" in 2014, when Ancestry cancelled support. Leanah is described as being from Virginia, as was John VINEYARD, and her birthdate estimated to be about 1767, with her age listed on 1850 & 1860 censuses. We know nothing about her parents. There are Sneed/Snead individuals living in Virginia in the mid-late 1700s, but I have yet to find the clue to identifying her family, e.g., naming patterns, church records, probates, etc. I can estimate a likely marriage for John and Leanah of about 1795ish, as the children show birth years within 2 years later, b. in Tennessee. Note, Tennessee became a state entity in 1796. All their children appear to have been born in Tennessee, according to the research I've been able to do to date. And then the family ends up in the Indian Creek area of White County, in the southeast corner of Illinois. Looking at maps, it seems to be a relatively straight westward-heading line from Virginia --> Tennessee --> Illinois (southeast), from one new territory to another. Perhaps this quick west-ward travel was as a result of new land becoming available, possibly even from military land grants of their parents. Leanah SNEED & John VINEYARD had the following children, all born in Tennessee. It is possible they had children before Joshua, marrying earlier than I postulate, but I have no records to show this. I have not researched the younger children and their families as yet. Thomas Milligan [ancestor], b. 12 Apr 1811; m.1 on 16 Aug 1830 IL to Priscilla POOLE, 10 children; m.2 on 30 Jan 1858 to Samantha Garrett, 4 children; m.3 on 19 Jan 1868 to widow Martha J. Thompson; no children. Leanah is shown living with her husband and their youngest son, Thomas M. Vineyard, his wife and family on the 1850 Census, White County, IL, as seen below. After her husband died after the 1850 Census in Norris, White, Illinois, Leanah is seen on the 1860 census, widowed, still living with youngest son, Thomas, his 2nd wife, and the children still at home. They are living right next door to Thomas' eldest son, Phillip Wesley Vineyard, 26 yrs old. A detailed biography has been added to the FindAGrave memorial page for son Thomas M. Vineyard, buried in Union Cemetery, Norris City, White, Illinois. Nothing is said on this memorial page about Thomas' mother, Leanah, however. In fact, I could not find a FindAGrave listing for either Leanah or her husband John. Where could they be? As far as I know they were living in White county IL before 1830, until their deaths, and there were children and grandchildren there. This year's challenge by Amy Crow is another weekly blog based on Themes, although it seems not always relevant for me to use! "Naughty" is the weekly theme, but I'm not following it. None of our ancestors seems to have run off with someone's wife, or stolen anything, or... Good solid people. So here's one more of my very early immigrant ancestors, Deacon Richard MILES II, from England to New Haven, Connecticut. He is my 10th great-grandfather in my mother's lines. Richard MILES II was the son of Richard MILES I and Alice CHERRYE, of Hertfordshire England, likely in the Wormley or Great Munden region. He was born approximately 1597, in Great Munden, Hertfordshire. Both his parents died about 1628, and he seems to have married shortly afterwards, certainly by 1632. He and his wife, with their first three children, immigrated to New Haven region, first to Milford, and then later moved to New Haven where he owned property by 1643. Mary, b. abt 1635 Herts, d. 12 Sep 1730; m.1/ 12 Dec 1654 ti Jonathan Ince; children; m.2/ 22 Oct 1661 in Norwalk CT to Rev Thomas Hanford. John, b. Oct 1644, New Haven CT. Note that Martha MILES Pardee is my 9th great-grandmother; Hannah WILMOT Merwin is my 7th great-grandmother; the lines braid. In 1646, Richard married a second time to a New Haven widow, Katherine Elithorpe Constable, originally from Yorkshire, England. She had no children from her first husband, nor any with Richard. He apparently was appointed deputy to the general court in 1651. Richard died Jan. 7th, 1666/67 in New Haven, CT, having written his will December 28th, 1666. Although a will is known of, and was probated by June 13th, 1667, six months later, I have not yet seen/found a copy of it. His second wife, Katherine, died almost 20 years later Jan. 8th, 1687/88, at the apparent age of 96 years, in Wallingford, CT, approximately 14 miles north of New Haven. Several resources provide information on the MILES family: Families of Ancient New Haven, History of the Colony of New Haven, and Families of Early Milford, are three useful texts, along with Genealogical and Family History of the State of Connecticut, Vol.III, which had potted histories as well. American Ancestors website databases are also helpful in shedding some additional light. If you know anything more about any of the above individuals, I would be so pleased for more details. And if you wish more information on them, I'm happy to share. Contact me at my address at the bottom of the page, or in the Comments section. This year's challenge by Amy Crow is another weekly blog based on Themes, although it seems not always relevant for me to use! This week the theme is "Holidays" - and I thought I'd write about ancestors and collateral relatives who have birthdays on Christmas Day & New Year's Day. Note that only direct ancestors have their surnames in CAPITALS. Emma Gertrude Graves, b. 25 Dec 1853, dau of Stephen Rensselaer Graves & Susan A. Barr, d. 1927, m. Clare A. Benedict 8 Dec 1874; 1st cousin 3x removed. For some reason I'd expected to find more than I did! This was a fun exercise, and brought up a few research questions once more, added to my to-do lists. This year's challenge by Amy Crow is to write a weekly blog based on Themes; I often don't use the themes, but I'm working my way through my original immigrants to North America, plus other interesting-to-me ancestors. They're all valuable... because they have contributed to my being here! This week, the challenge is Thankful, and I'm thankful for them all. I have chosen to write about another woman ancestor about whom I know extremely little: my 3rd great-grandmother, Sabra TOWERS. I researched female names, and learned that Sabra may be a nickname for Sabrina... or, not. But it gives me another name to put on the list when I'm going through databases, books, and other records. Sabra was born 22 Aug 1805 in Schaghticoke, Rensselaer, New York, as stated in the Oakwood Cemetery burial register book in Syracuse, Onondaga, New York. Her father is known only as "S. Towers" as written in the same burial register book, The Towers family likely moved to the region which may have included one or more of the towns of Baldwinsville, Manlius, Van Buren, and Syracuse, somewhere before 1824. The distance is about 150 miles due west. Harriet "Hattie" Philena, [ancestor], b. 28 May 1827 Manlius NY, d. 20 Aug 1929, Englewood, Bergen, NJ; m. 26 Sep 1850 in Syracuse NY to Charles Giles GRAVES; 3 daughters (middle one is direct ancestor). Anna Caroline, b. July 1829, Baldwinsville NY, d. 4 May 1910 Elbridge NY; m. abt 1850 to John Leary, no children. Sabra J,, b. 28 Feb 1831, Van Buren NY, d. 30 Jul 1842 Baldwinsville NY; grave removed to Syracuse 23 Oct 1869 and buried in family plot. Mary J., b. 14 Jun 1832, Van Buren NY, d. 9 Jul 1836 Baldwinsville NY; grave removed to Syracuse with sister's, 23 Oct 1869 and buried in family plot. I have not as yet found any censuses with S. Tower(s) in the region around Baldwinsville or Manlius in Onondaga county. However there is a Luke Towers listed in Schatighticoke tax rolls from 1799-1803... Is it possible an L was read as an S, on Sabra's death registration? I have copied some records and will try to follow any of the Towers individuals I've found in the early 1800s - Luke, Reuben, and a woman, Jemimah who shows up only once, on the 1801 Tax Assessment roll for Schaghticoke. Crumbs of clues to follow. And of course, they may not be related at all! Aged 63 years, Sabra died of "Jaundice" on 13 Aug 1869, and was buried two days later in the Oakwood Cemetery, in the ORMSBEE/GRAVES family plot, in Syracuse, New York. The very helpful FindAGrave volunteers there are transcribing data from the burial register books and adding them to the appropriate grave memorials, over time, (there are over 58,000 burials!). Thank you Tom and your friend(s) for all your help! If you know anything more about Sabra (TOWERS) Ormsbee, I would be so pleased for more details. Contact me at my address at the bottom of the page, or in the Comments section.